Gavin DeGraw and Matt Nathanson will play Red Hat Amphitheater in Raleigh on August 5. 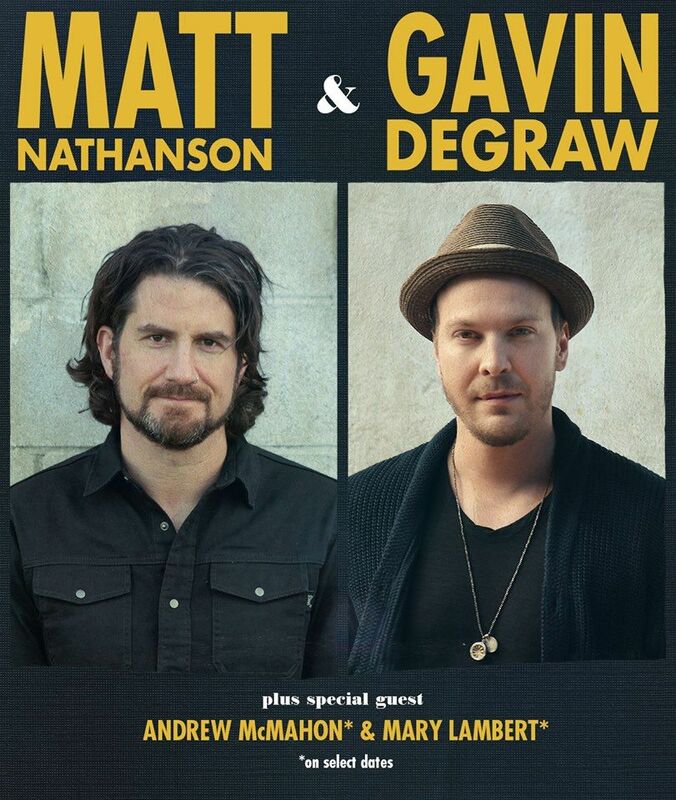 Multi-platinum, Grammy nominated recording artist Gavin DeGraw and acclaimed singer-songwriter Matt Nathanson have announced their co-headlining 2014 North American tour with special guest Andrew McMahon. Kicking off on Saturday, June 14th in Tucson, AZ, the tour will include a slew of dates in major US markets including San Diego, Los Angeles, New York, Philadelphia and Boston. Fans can expect to hear DeGraw perform songs from his acclaimed fourth studio album, Make A Move, including the hit single “Best I Ever Had” and his latest smash “Make A Move.” The album has garnered rave reviews since its October 15th release with People Magazine describing the album’s first single “Best I Ever Had” as “the kind of switch-up that brings fresh energy…” while Entertainment Weekly raved about DeGraw’s “intricate piano hooks and seductive, gravelly voice.” DeGraw is also scheduled to open a number of dates this summer for legendary performer Billy Joel. Matt Nathanson has long been a fan favorite with his vivid songwriting, infectious melodies and dynamic live shows. His latest album Last of the Great Pretenders has been hailed as the ‘Album of the Week’ by USA Today adding “he has a way of drawing people into his stories.” The album features the song “Heart Starts,” the catchy theme to Lifetime’s Series Celebrity Bucket List – of which Nathanson was recently featured – as well as the hit single “Kinks Shirt which continues to climb on the HAC chart and is also being heard on America’s Top 40 with Ryan Seacrest, The Billy Bush Show and Rick Dee’s Countdown. The video for “Kinks Shirt” which premiered on Rolling Stone.com was directed by actor/comedian Bobcat Goldthwait. For further details visit www.livenation.com www.gavindegraw.com or www.mattnathanson.com.